Sterling Silver Earrings with Iolite. Sterling Silver Earrings with Oval shape Black Onyx stone. 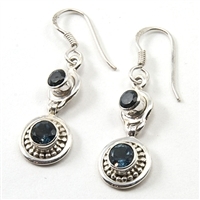 Designer Silver Earrings with moonstone - also available in light blue color Sterling Silver Earrings with two Iolite stones in rich Blue shade. Sterling Silver Earrings with two Iolite stones which is in Blue-Purple shade. Sterling Silver Earrings with Peridot. Sterling Silver Earrings with two Peridot stones. Light weight Sterling Silver Earrings with Aquamarine stone. 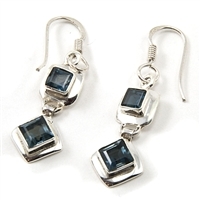 Sterling Silver earrings with two different shapes of Apatite stone in blue color. Sterling Silver Earrings with two Aquamarine Stones. Also available in Garnet. Sterling Silver Spiral shape earrings. Sterling Silver Leaf shape earrings. LIGHT WEIGHT PURPLE COLORED AMETHYST EARRING ON STERLING SILVER LIGHT WEIGHT PURPLE COLORED FLOWER CUT AMETHYST EARRING ON STERLING SILVER Light weight everyday wear Silver earrings. Matching Pendant available. Light weight everyday wear leaf shape Silver earrings. Matching Pendant available. Sterling Silver Butterfly shape earrings. Sterling Silver Dragonfly shape earrings. Light weight everyday wear Butterfly shape Silver earrings. Matching Pendant available. Light weight everyday wear Drangonfly shape Silver earrings. Matching Pendant available. Sterling Silver Earrings with Iolite stone in Violet -Blue Color. Also available in Citrine which is Yellow-Gold Color. 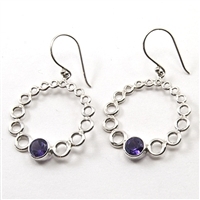 Sterling Silver Earrings with Amethyst, Deep Purple in Oval Shape. Rhodium plated Brass Earring with teardrop and oval shaped ruby zircon Rhodium plated Brass Earring with colored zircon in teardrop shape, appropriate for evening wear, available in multiple swatches. Beautifully handmade Leaf shape bead necklace accompanied by earrings. The length of the necklace is 25". Artist's Name - Yeva Dade Beautifully handmade, Light weight, Citrine and Lava stone necklace with earrings. These stones combine for success and abundance. The length of the necklace is 20". There is a lot to be said for simple stunning sterling silver earrings for women. Made from luminescent silver and enhanced with the visual artistry of design and style, what you get is a spectacular collection of multi colored stone earrings jewelry that has been handpicked to complete your perfect look. Fashion Jewelry America has great assortments for you to choose from but a pair of multi colored stone earrings spells subtle elegance, catches the imagination and transforms your entire look with just a single piece. With our affordable priced range, you get to choose diverse pieces for varied occasions. Fall in love with our sterling silver band rings earrings collection and we guarantee that these light weight wonders will be just the thing to enhance your day. Fashion Jewelry America brings huge variety of beautiful and exquisite sterling silver earrings for women online; here one can easily buy multi colored stone earrings online. Our sterling silver earrings for women are in huge demand in the US. The collection of sterling silver earrings has their own beauty and archaic look along with they do not tarnish and shine brilliantly. Our other range of multi colored stone earrings makes a deviation from the traditional designs and can be used for both casual and formal occasions. They do have unique designs, exclusive ones for young and old, antique in appeal and finely finished. The multi colored stone earrings are studs, especially the pearly looking ones which are a rage with the elite women. Check out our online stores and explore the vast collection of multi colored stone earrings, silver rings and many more.